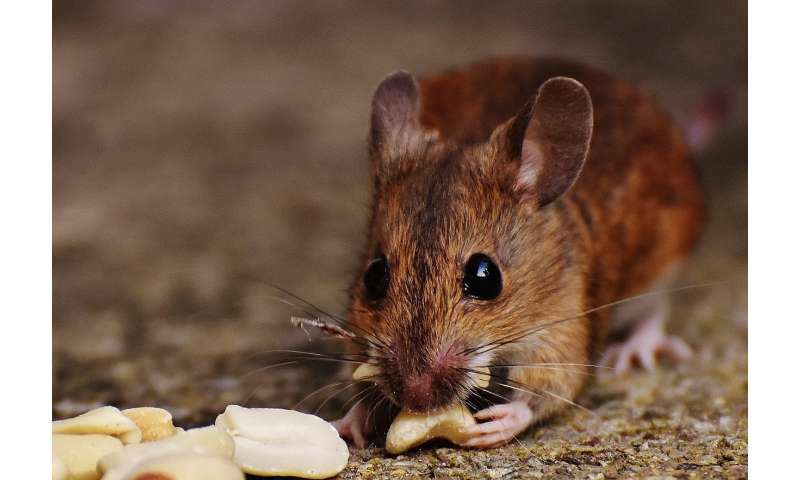 A large team of researchers working over a period of 15 years in Switzerland has found that self-domesticating mice tend to evolve in ways similar to some animals that are intentionally domesticated by humans. In their paper published in the journal Royal Society Open Science, the group describes their project and their findings. In 2002, a group of researchers embarked on a long-term study of the behavior of common mice and disease transmission. To that end, they trapped several specimens and let them go in a special barn—one with doors small enough to keep out predators. The researchers also offered plenty of food and water, an enticement to stay. Over the next several years, the population of mice grew and the researchers got to study them. Then, in 2006, one of the researchers noticed that the mice had begun developing small patches of white fur, something unknown in the wild. As time passed, more of the mice sported the peculiar white patches. By 2016, the team reports, the number of mice with the white patches had doubled. Curious at the change, the team took a closer look and found that head size had changed, as well—becoming smaller by 3.5 percent on average, mostly due to shorter snouts. The shorter snout was notable because it was a feature also reported by a team that famously conducted a study of captive foxes back in the 1950s in Siberia. The foxes were not deliberately tamed, but the researchers only allowed those with the most tame traits to breed. Over multiple generations, several physical changes occurred, including the development of shorter snouts, curly tails and floppy ears—making the foxes look more like domesticated dogs. A century before, Charles Darwin had named such changes "domestication syndrome." The results reported by the team in Switzerland suggest that the same type of domestication changes can occur even when the animals domesticate themselves. Currently, the exact mechanism behind such changes is not known, though some in the field have suggested it is likely tied to the neural crest, a group of cells involved in early development. Similar phenotypic changes occur across many species as a result of domestication, e.g. in pigmentation and snout size. Experimental studies of domestication have concentrated on intense and directed selection regimes, while conditions that approximate the commensal and indirect interactions with humans have not been explored. We examine long-term data on a free-living population of wild house mice that have been indirectly selected for tameness by regular exposure to humans. In the course of a decade, this mouse population exhibited significantly increased occurrence of white patches of fur and decreased head length. These phenotypic changes fit to the predictions of the 'domestication syndrome'. I have the idea that perhaps the human-provided food, while not only plentiful, was also likely larger seeds and softer types of food than they would have to eat in the wild, especially with hard winters and worries of predation. The Predation side offers possiblities too, if they are protected they may not need as keen of noses to detect the predators, and so this gets scaled back as 'not needed' or 'not as important' since less energy is required than if these organs are expanded and highly sensitive. Certainly we know that our own noses help control temperature by the way the blood vessels are arranged. So, there is the possibility, as shown, that a warm, safe and soft-plentiful-food environment may all have led to making the domesticated breed, but it would thus be less likely to survive in the wild, but better adapted to the 'new' living conditions.